Experience a highly dynamic and very comfortable ride with the Indoor Bike GR7 from Horizon. 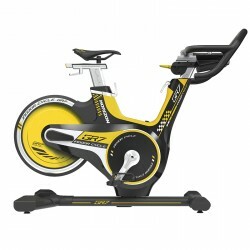 The high quality Indoor Cycle offers an almost soundless rotation but is also suited for intense training sessions. Horizon Fitness offers you two high-quality indoor cycles with perfect equipment features: the beginner model Horizon S3 indoor cycle and the successor model indoor cycle Elite IC 4000, which completes the first-class Elite series of the brand Horizon Fitness. The Horizon indoor cycles are especially designed for home use - with valuable components and a well-thought out design. 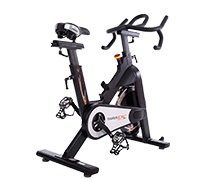 Compared to the Horizon indoor cycle S3, the Horizon indoor cycle Elite IC 4000 is equipped with a training console with 4 inches LCD display. The clear display shows you all important training data like scan, time, speed, distance, calories, heart rate, RPM, and temperature. The Horizon indoor cycle S3 surprises with an impressive balance mass of 22 kg. 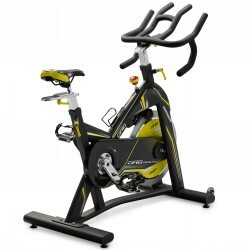 Compared to the Horizon indoor cycle Elite IC 4000 provides a balance mass of 20 kg. The balance mass ensures a comfortable and smooth concentric run. The silent, maintenance-free belt drive is an important equipment feature of both models. The pedal resistance is infinitely variable with a well-to-reach control knob below the handlebar. In addition, both models are equipped with an emergency stop button. As indoor cycles do not have a freewheel, that means the connection to the balance mass is fixed, it is important that the pedals can be stopped at every time. Here, you need the emergency stop button. In addition to the stable and high-quality frame build, the indoor cycles of Horizon Fitness convince by their high training comfort. Both models, the Horizon S3 and the Elite IC 4000, are equipped with important adjusting mechanisms: the multi-position handlebar can be easily adjusted in height with a quick release. The ergonomically shaped race saddle is infinitely variable in horizontal or vertical direction and thus individually adjustable to the height of the user. The important extras like a bottle holder, height levelling, and transport wheels complete the user-friendly equipment of Horizon Fitness indoor cycles.